Archery hunting seasons are either here (some antelope seasons), or are right around the corner. There is still time to get fit to ward off injuries and accidents during a physically demanding hunt. The usual hikes with an appropriately weighted pack, bow, etc. are staples of pre-hunt fitness preparations. Do those hikes on hilly surfaces and you're another step ahead. (Excuse the pun.) There are some very specific exercises that you can do to improve efficiency when walking long distances. That efficiency will result in less fatigue and strengthen your body against over-use, too-much-to-soon injuries. You can see some basic exercises for strengthening your core and your legs on our Hunting Fitness page, but below are some more exercise you can add to increase your strength and fitness. Hunting is an athletic endeavor! Here are some things I do twice a year. Once as part of my preparation for an annual spring marathon. Then again in preparation for fall elk hunting! Ideally, all of these should be done on hills, but you can start on flats and build up. Start easy to avoid injury before you even get to your hunt! Do these sets for 30-60 seconds each. 1. One leg uphill hopping: Jump forward on one leg for 30-60 seconds. Your other leg should be off the ground, except for a light tap to keep your balance. Switch legs and repeat. 2. Uphill bounding: Alternate legs as you bound uphill without pausing. No need to go for a lot of height, just make a little extra effort as you "bound" uphill from one leg to the next. 3. Fast in-place running with slight uphill progress. Point your knees outward a bit for these and pump at a reasonably fast pace as you basically run in place. 4. Downhill heel walking: Keep your toes off the ground as you walk quickly downhill. 5. Uphill backwards walking. Head back uphill without turning your body around. Look over your shoulder to make sure you don't step on a rough spot and get hurt. 6. Uphill skipping for speed. Attain very little height, just skip quickly. 7. Uphill skipping for height. Continue skipping for another 30-60 seconds, this time achieving significant height with each skip. I do these exercises after a one mile jog warm up. Then another one mile cool down afterward. Sometimes I precede these with six uphill hard runs of about 200 yards, jogging easily back down between the hard runs. Match all your training to your own current ability. You would be better off not doing them at all, rather than getting hurt trying to get fitter. Go easy until you know what your body can stand at your current fitness level. I've killed several elk with Slick Tricks. 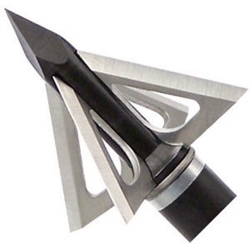 When we stocked our new pro shop, Elk Tips Outdoor Gear, in Deer Lodge, MT, we purchased a large amount of Slick Trick Broadheads at a great price. We can pass those savings on to you at almost 20% off MSRP!